Shapinsay first features in recorded history when King Håkon IV of Norway assembled his fleet in Elwick Bay, off what is now the village of Balfour, in 1263. He was heading south to what turned out to be defeat by the weather at the Battle of Largs. This was followed by his retreat to Kirkwall and subsequent death in the Bishop's Palace there on 16 December 1263 (see our Historical Timeline). The next major development for Shapinsay had its roots in the failure of the Rajah of Tanjore, in India, to repay loans made to him in the 1780s by British investors. The MP for Orkney at the time was John Balfour, who helped persuade the British Government to compensate the investors. The fact that he had married the widow of a Colonel Mackennan, who had been one of those investors, boosted his fortune considerably. The Balfour family already owned property on Shapinsay, and used the Government compensation to buy the rest of the island in 1790. 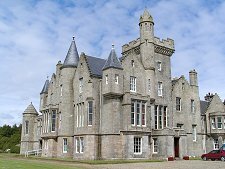 In 1847-8, David Balfour turned the earlier and smaller Cliffdale House into Balfour Castle, which still dominates the southern end of Shapinsay today. 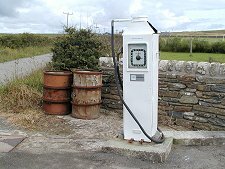 Shapinsay's economy had done well during the 1700s. Each year the island exported 3,000 tonnes of burned kelp for the alkali industry, bringing in the incredible sum of £20,000 per year. With the ending of the Napoleonic Wars, much cheaper raw materials became available from the continent and the kelp industry died. David Balfour's response was to reform the agriculture of Shapinsay. He built the straight roads that are such a feature of the island today, and divided the land into well-drained 10 acre squares. Not an excessively modest man, he also laid out a planned estate village on the site of Shapinsay's main village of Shoreside, which he persuaded the Post Office to rename Balfour. He also built the nearby mill and the gasworks. David Balfour is remembered with mixed feelings on the island. His improvements were dramatic and much needed, and came at a time when the laird's more normal response to the economic problems sweeping Scotland was to clear the land of its people to make room for sheep. Balfour showed that alternatives were possible. Yet he was also the sort of man who set up an informal militia so he could call himself "Colonel Balfour": and his tendency to name everything in sight after himself has already been noted. The only surprise is perhaps that Shapinsay is not itself now called Balfour. The island's name remained unchanged however, and the Balfour family sold much of it to the tenants in the early 1900s. Despite this, today's Shapinsay still owes much to the pattern set by David Balfour. Any tour of Shapinsay usually starts in the south west corner. Here you find Balfour Castle and its gardens and the village of Balfour. This is also where the frequent ferry service to Kirkwall berths. 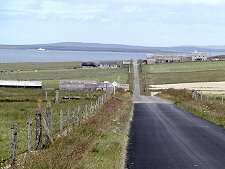 From Balfour, Shapinsay's south coast runs east to the sandy Bay of Sandgarth and nearby Haco's Ness. En route it passes the Old Church and Kirkyard, which houses the burial ground of the Balfours. 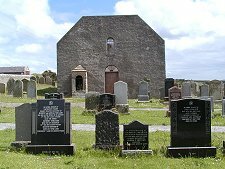 The first church was built here in 1559, the more recent, now also disused, was built in 1802. The current church is located a little inland. 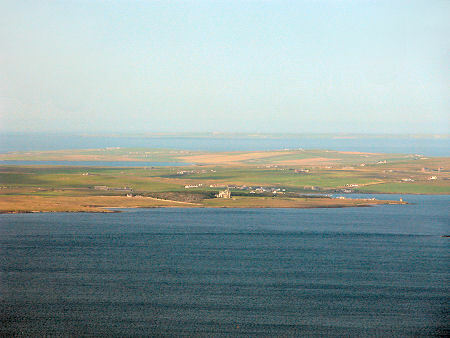 From Haco's Ness the coast heads north past the shallow indentation of the Bay of Linton for about seven miles to the Ness of Ork, Shapinsay's most northerly point. Part way up and a little inland is Mor Stein, Shapinsay's major standing stone, now clad in a thick coat of green moss. Overlooking the head of Linton Bay are the remains of a chapel, thought to date back to the 1100s. 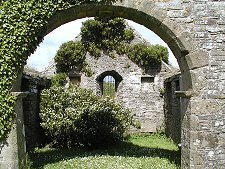 It is said that a local farmer removed the lintel from the chapel to use in a byre for his cattle in the early 1900s. He returned it promptly on finding two of his cattle mysteriously hanged in the byre. Further north and close to the shore is Burroughston Broch, an Iron Age defensive site accessible to visitors. This was originally excavated in 1861 by George Petrie with the assistance of the landowner, David Balfour. 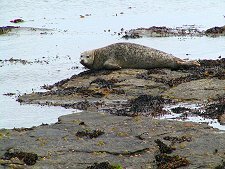 The shoreline close to the broch provides one of the best opportunities on the island for seal watching. 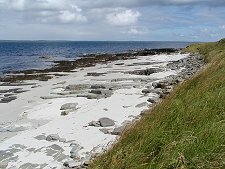 The north coast of Shapinsay curves deeply between the points of Ness of Ork and The Galt, another good site for spotting seals (and sea birds). At the head of Veantro Bay simply lying on the beach is the large Odin's Stone, thought to be associated with Viking offerings to Odin. 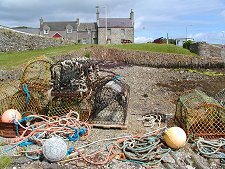 Shapinsay's west coast returns to the starting point of this circular tour at Balfour, and tends to be sandier than the rest of the coastline. En route it passes WWII gun emplacements at Salt Ness and a picnic area on the coast near Vasa Loch.